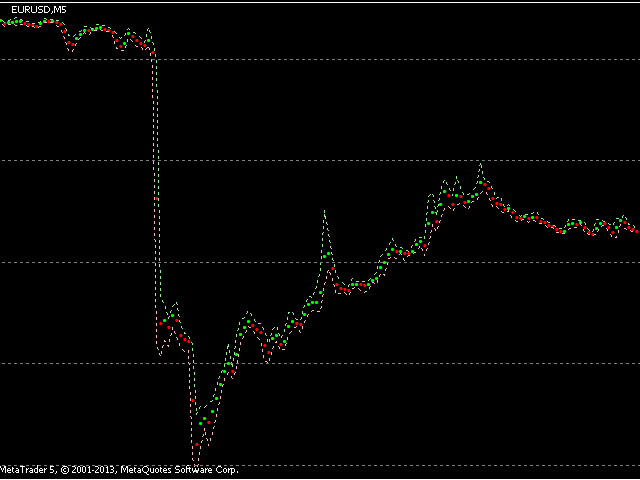 The alternative representation of a price chart (a time series) on the screen. Strictly speaking, this is not an indicator but an alternative way of visual interpretation of prices along with conventional ones - bars, candlesticks and lines. Currently, I use only this representation of prices on charts in my analysis and trading activity. In this visual mode, we can clearly see the weighted average price value (time interval's "gravity center") and up/down dispersion range. A point stands for (Open + High + Low + Close ) / 4, the upper dashed line is High, the lower one is Low. We can clearly see price acceleration/deceleration, steady increase/decrease, various spikes reaching stop levels, chaotic movements, as well as range/flat areas. All this can also be seen when using candlesticks but I think that the offered representation is more comprehensible. Weighted average price - as a point. High price value - as a dashed line above the point. Low price value - as a dashed line below the point. 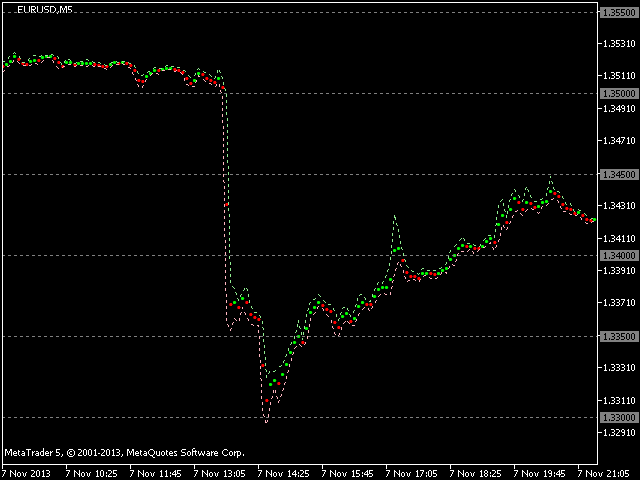 "Round" price levels - as dashed lines. Points Size - point size (small/large). Show Time Scale - show/hide the time scale on the current chart (Fig. 2). Show Price Scale - show/hide price scale on the current chart (Fig. 2). Show Round Levels - show/hide "round" price levels. Round Levels Step in Points - distance between adjacent "round" levels in points - it is usually set as multiple of 500. Up & Down Round Levels Number - number of displayed "round" price levels above and below the current price. If set to 4, the levels closest to price (4 below and 4 above) are displayed. Chart Color Schema - indicator's color scheme. The following schemes are available: light/dark/black on white/white on black. Below is the offer for active users and all those who keeps reading to this line. If you have any interesting ideas for improving this or any other product I offer, then you'll get a big discount for any of my products if the idea is realized. Please write all your suggestions on the Comments tab, so we can have a documentary proof of the ideas and see who the first author is. Вопрос - а как вернуть привычный график баров-свечей после удаления этого индикатора? прошло 3 мес. как работаю с этим индикатором. Вначале привыкал, счас, когда построил ТС с ним, уже другого не хочу. Один минус нельзя удалить или поменять цвета, линии полос отвечающих за хай и лоу бара.С ним желательно совместить параметры волатильности - предыдущего бара и за несколько баров.